Don Paitrick, head tennis director at the University of Mary Washington’s new University Tennis Centre, was honored with the NIRSA/USTA National Professional Tennis Ace Award at the 2007 NIRSA (National Intramural-Recreational Sport Association) Annual Conference and Recreational Sports Exposition held in Minneapolis, Minesota April 18-21. The United States Tennis Association (USTA) and the National Intramural Recreational Sports Association (NIRSA) honor a NIRSA Professional Member by presenting the National Professional Tennis Ace Award during the NIRSA Annual Conference each year. This award honors an individual that has been implementing a NIRSA-endorsed USTA Tennis On Campus program. It is intended to reward the winning member and publicize his or her effort to grow tennis participation on campus. Don has been instrumental in the start and growth of Tennis on Campus at the University of Mary Washington, where the first ever Mid-Atlantic Section Campus Championships were held in 2006. USTA/Virginia congratulates Don on this great accomplishment as being recognized as the best in the Nation for 2007! 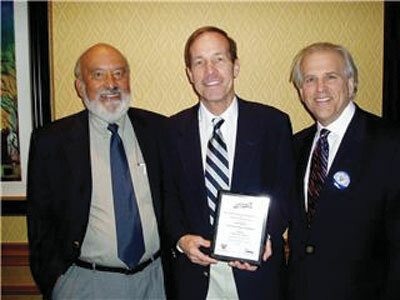 Don is shown here receiving his award from William Rivera, USTA Director at Large, and Jon Vogren, USTA/NCAA Collegiate Director.